Hertzian contact theory is a classical theory of contact mechanics and is a very useful tool for engineers and researchers. Even though the derivation of the theory is relatively difficult, the final solution is a set of simple analytical equations relating the properties of the system to the developed stress. Hertz theory was also successfully applied to get a first analytical solution of Elastohydrodynamic lubrication theory (this solution is known as Grubin’s solution). Here, the main equations of the theory are considered, while the full derivation and the description can be found in the classical contact mechanics books [1,2]. Surface are infinitely large half-spaces. All the assumptions of the classical theory of elasticity apply (small strain, homogeneous material). Here is the elastic deflection, is the reduced elastic modulus, are the Poisson’s ratio and Young’s modulus of the bodies, is the contact pressure. Fig. 1. Sphere in contact with flat. where is the applied load. Hertz theory briefly described is applicable for the case of spherical, cylindrical and elliptical contacts. List of all expressions of the Hertz contact theory is given here (this list includes solution for spherical, elliptical (point) contacts and cylindrical (line) contact). A Matlab code of Hertz solution is given here. The online calculators to obtain Hertz solution for a spherical (elliptical) case is given here, for a cylinder (line) contact case is given here. Further overview of the case of contact of two spheres can be found here. Contact Mechanics and Friction, V. Popov. Should Contact pressure/hertz contact stress be less than Ultimate stress of a material ? 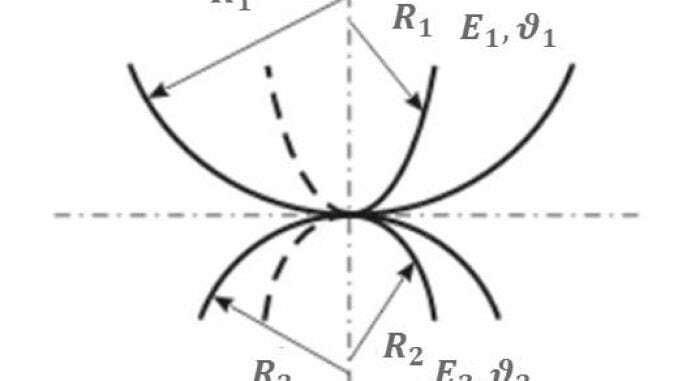 ı think, the hertzian contact ( principal ) stresses should be less than the yield stress of material, otherwise some permanent damages will be occurred on the contact surface of two elastic bodies.